Streams of the River: Lord . . . don't you care? Lord . . . don't you care? A little talk from a retreat I gave a few years ago . . . The Sea of Galilee is a large inland lake, about thirteen miles long and seven miles wide. The Jordan River flows through it from north to south, and the fishing and farming businesses it supported were famous in ancient times. Important trade routes passed along the lake’s western shore giving rise to a bustling multi-lingual, multi-ethnic, society. Just the right sort of area for Jesus to reach out to the crowds. The region could even be called “Galille of the Gentiles.” The towns of Capernaum, Bethsaida and Tiberias, where Jesus spent a lot of his time, were there. The lake itself is 700 feet below sea level, surrounded by plateaus. Sometimes the air pressure changes dramatically without warning. When this happens huge gale-force winds sweep down, and the kind of unexpected storm described in our reading is the result. He had poured himself out in ministry to the crowds - teaching, healing, loving . . . just being with the wounded and hurting children of God. As the day was ending he answered even more questions and helped even more people understand the ways of God. Eventually he called out to his disciples, “Let’s go over to the other side.” That meant sailing thirteen miles to the region of Gadara. It would be long enough for him to have a decent sleep in the back of the boat. Now, these disciples were professional fishermen, highly skilled with boats. Every day they were on this lake casting their nets. Nobody knew more about boats or about the Galilee lake than they did. They could handle storms. But this was no ordinary storm. This was the mother of them all! They’d never seen anything like it. 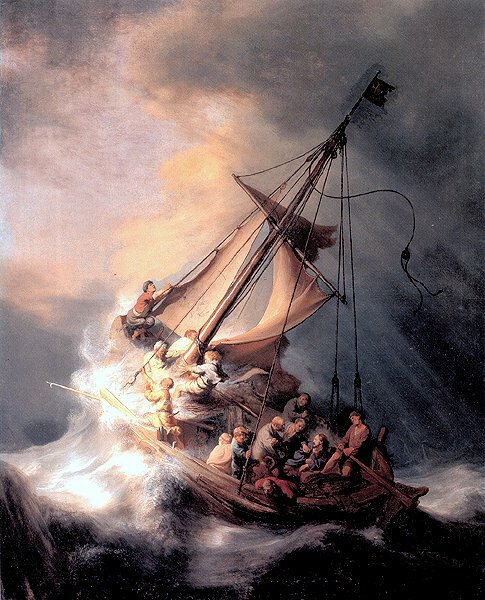 The waves kept crashing over the boat, pounding it, shaking it with enormous force. These tough experienced fishermen were gripped by fear. They lost their nerve. They imagined the worst. They looked around to see where Jesus was. After all, it was his fault. It was Jesus who had sent them out across the lake. It was he who had kept them standing there while he insisted on talking with people until the sun went down. They had warned him about the night-time squalls on the lake. Where was Jesus now? Sleeping! On a cushion! The boat looked as if it would sink, and Jesus was sleeping on a cushion! Could he really be so tired as to sleep through the storm and their fear? So they woke him up. “Don’t you care if we drown?” They were so upset that he wasn’t panicking. After all he had done for them, they actually accused him of not caring about them. Full of fear in the midst of the raging storm, they vented their anger at him. Haven’t you done that? I must confess that I have. When there is a real crisis, our anger boils over and we have to find someone to blame for our problems – even the Lord. (Especially the Lord!) Those disciples were like you and me. When they came to Jesus they didn’t ask him what to do, or even to help. They just accused him of not caring about them. We forget that in the story of the two house builders (you know – the wise man who built his house on the rock, and the foolish man who built his house on the sand) Jesus didn’t say to those who followed him “IF” the storms come. He said “WHEN” the storms come. Look at the passage again. Jesus dealt with the storm. How did he do it? He just spoke the words, “Peace, be still.” Then there was calm. It says that the disciples were now “in awe” of him. Why was that? I’ll tell you why. It was because in the amazing picture language of their Jewish Scriptures (what we call the Old Testament) it is God alone who has the power to subdue the raging seas (Psalm 89:9, 93:4, 107:28-29). And, of course, he also stilled the storm in their hearts. We are all in the same boat. Sooner or later we are battered by storms of one kind or another. Every storm tests our faith in God; every crisis reveals whether or not we have learned to trust him. Jesus has promised to stay with us, even - especially - in the midst of the storms that threaten to wipe us out. He loves us with an everlasting love. We can trust his love. We might be shaken to the depth of our beings. Sometimes there are beautiful friends who help get us through. But every now and then we are alone, even in a crowd. So alone . . . except for Jesus. Let’s turn to him, and call out to him in our distress. Let’s trust in his love. Let’s remember the frightened disciples on the evening of Easter Day when Jesus appeared in their midst, stretched his nail-pierced hands and gave them his peace. “Peace, be still!” He still speaks. He still sends out his Word. His Word still subdues the storm and heals us on the inside. We know who he is. If we trust him and hang on, no matter how bad things are, his peace – that wonderful supernatural gift of his – the “peace that passes all understanding” (Philippians 4:7) – will protect us and keep us sane, for it is still a “peace that the world cannot give” (John 14:27).